Michelle Obama is the real MVP of the Obama administration. Last week, Michelle Obama made headlines as she wowed the country with a speech rebuking Republican presidential nominee Donald Trump. Two days before, President Barack Obama was taking questions during a town hall meeting with The Undefeated at North Carolina A&T State University in Greensboro, North Carolina. And while the first lady was in Washington, D.C., at the time, her presence loomed large. She might have started as a reluctant political spouse, but she’s evolved into one of most formidable voices of the Obama administration, all while quietly subverting the strictures of an unofficial office that draws no salary. Michelle Obama doesn’t just complement her husband’s messaging — she influences it for the better. If the president has a consistent weak spot with black folks, his most loyal group of supporters, it’s his proclivity for condescension — or as Ta-Nehisi Coates labeled it, “targeted scorn.” The president has a reputation for addressing black audiences in language thick with paternalism, to the point that he inspires a complicated array of feelings whenever he’s going to address a historically black college or university, given his 2013 commencement speech at Morehouse College. It’s a mix of pride and anticipation, followed by a sense of dread. In recent years, President Obama seems to have somewhat tempered this habit, and his 2016 address to graduates of Howard University was better received. Whenever his audience is predominantly black, there’s a question of which Obama you’re going to get: The one who told black parents in 2008 to stop feeding their children “cold Popeyes” for breakfast, and lectured heavily on absentee black fathers, or Howard Obama? North Carolina A&T found out when the president took a question from Khadejah Stegall, a 21-year-old senior from Laurel Hill, North Carolina. Stegall explained that she had a 1-year-old daughter and that she was married to a Ph.D. student. “As the president of the United States, a husband and a father, what is one trait you believe one must possess in order to overcome challenges while also balancing a family?” Stegall asked. President Obama took his time delivering his answer. “I think the trick — and this is more directed at your husband — he should just do what you tell him to do, which has worked very well in my house,” he said with a smile. “The truth is that balancing professional achievement and family is something that Michelle and I have had to wrestle with. She’s talked about it at length. I have, too. I think that it’s particularly burdensome on the mom. That’s why my message is probably more for your husband than for you, which is you have to be there, and present, and at home. 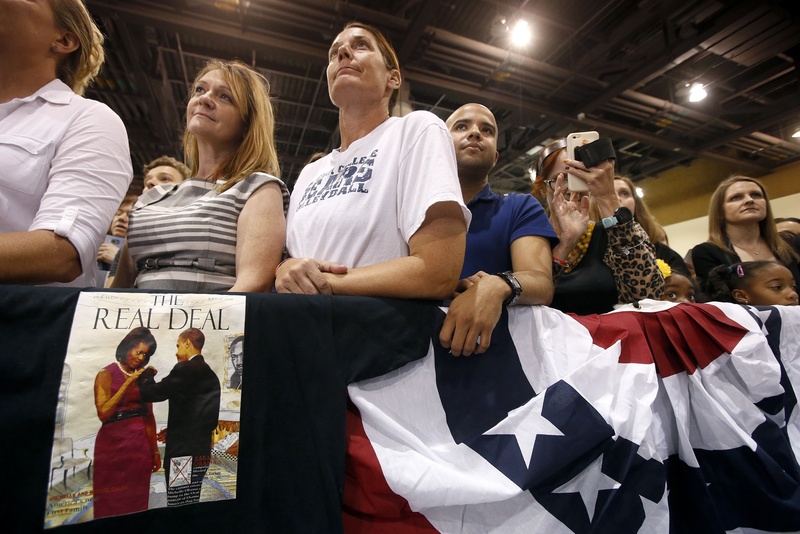 Democratic supporters listen as first lady Michelle Obama speaks during a campaign rally for Democratic presidential candidate Hillary Clinton Thursday, Oct. 20, 2016, in Phoenix. Aha. It wasn’t Popeyes Obama or Howard Obama. It was, mercifully, Obama with Michelle in his ear. In Greensboro, President Obama couched his rhetoric in feminism and egalitarianism with a dose of self-deprecation thrown in for good measure rather than the tone of finger-wagging black scold. It wasn’t that long ago that Michelle Obama’s decision to take up the mantle of Mom-in-Chief was controversial, and to some feminists, disappointing. In Politico magazine, Michelle Cottle declared her a “feminist nightmare.” Michelle Obama, after all, is only the second first lady, after Hillary Clinton, to hold a law degree. She’s the third, after Clinton and Laura Bush, to hold a graduate degree, period. She had been a high-powered executive in Chicago, and now she was just going to be … Mom? This turned out to be a gross underestimation of Michelle Obama, because if nothing else, she has wielded the soft power of Mom-in-Chief like a patriarchy-dismantling rapier. “Mom” might just have been the perfect model for Michelle Obama because it was so nonthreatening. “We tend to understand the nation metaphorically in family terms: We have founding fathers. We send our sons and daughters to war. We have homeland security. The conservative and progressive worldviews dividing our country can most readily be understood in terms of moral worldviews that are encapsulated in two very different common forms of family life: The Nurturant Parent family (progressive) and the Strict Father family (conservative). But if our 44 presidents are a series of fathers steering the country, what then do we make of first ladies? Especially this one? Moms, and especially first ladies, aren’t considered threatening because we don’t think of them as having real power. But where some of her husband’s actions have inspired ambivalence, disappointment or resentment, Michelle Obama is seemingly immune. She’s more popular than the president and her approval ratings are consistently higher than his. (Such is the benefit of not holding, or aspiring to hold, elected office.) Even when he lets loose, singing a few bars of Al Green, or Amazing Grace, the president remains his professorial self. The first lady, on the other hand, is mom dancer, friend and role model to Beyoncé and Carpool Karaoke rock star. It wasn’t until Clinton was sold as part of a “two for the price of one” deal that a woman presented a challenge to how we saw the first mom, and the country didn’t like it. After the Clintons failed to pass health care reform, Clinton was chastened and withdrew into the traditional role of first lady as White House hostess. Michelle Obama’s bank of goodwill is what makes her such an effective political surrogate, so much so that she was deemed “The Closer” for her ability to persuade wavering voters to elect her husband. The White House has become a master of exploiting Michelle Obama’s soft power, and in that sense the Obamas have a political partnership. When President Obama was in Greensboro, he was there to discuss My Brother’s Keeper, his mentorship initiative for boys of color aimed at disrupting the school-to-prison pipeline. President Obama has been criticized for neglecting to include girls of color, especially when research showed that black girls were being subjected to the same punitive disciplinary forces at even higher rates than black boys. That day, the White House press office was on offense, pelting reporters’ inboxes with emails about Let Girls Learn (the first lady’s initiative advocating for the education of girls around the world, which was launched in 2015), and her remarks commemorating the International Day of the Girl. 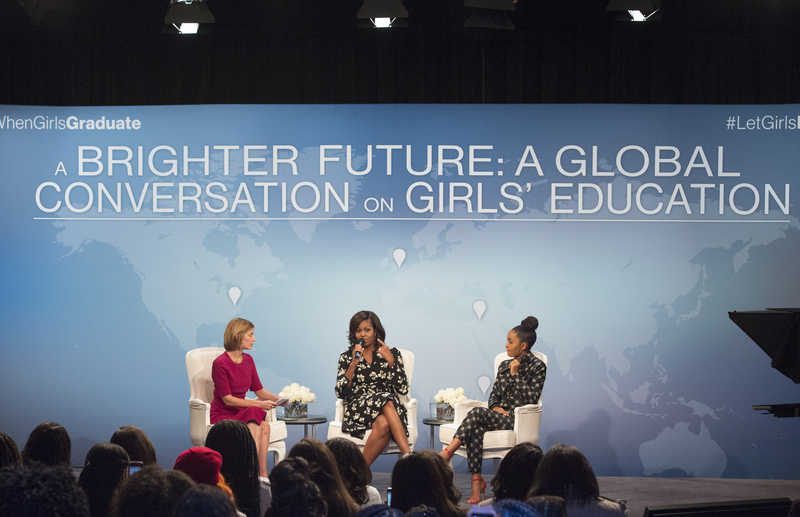 First lady Michelle Obama, accompanied by actress Yara Shahidi, right and Glamour magazine Editor in Chief Cindi Leive, participates in Glamour’s “A Brighter Future: A Global Conversation on Girls’ Education,” in celebration of International Day of the Girl and Let Girls Learn, Tuesday, Oct. 11, 2016, at the Newseum in Washington. She has also used the first lady’s role of hostess and socialite to open the White House to everyone, not just foreign dignitaries, but Girl Scouts and children around the country, using PBS’ In Performance at the White House series as an opportunity to connect children with artists performing at the White House through afternoon workshops. It’s only been in the last years of the Obama administration that Michelle Obama has been transformed into a full-throated, unambiguous advocate for feminism. That was, in part, because she had to spend so much time establishing herself as nonthreatening, but also because she was responsible for the bulk of parenting Malia and Sasha. Now that Malia is taking a gap year between graduating from Sidwell Friends School and attending Harvard University, and Sasha is in high school, we’re witnessing the sharpness and the power of a woman who’s able to dedicate more of her time and energy to getting Clinton elected and pursuing her own initiatives. One result of all that work was apparent last week when she delivered the most intimate and affecting speech of her tenure during a rally for Clinton in New Hampshire. It reverberated through the press even more than any of her Democratic National Convention speeches. If Michelle Obama spent the past eight years as relatable and authentic, it paid off when she found herself beseeching the country to protect her and every woman from a man accused of sexual assault. “I have to tell you that I listen to all of this and I feel it so personally, and I’m sure that many of you do, too, particularly the women,” Michelle Obama said. “The shameful comments about our bodies. The disrespect of our ambitions and intellect. The belief that you can do anything you want to a woman. Michelle Obama is an avatar for the shift in messaging of the Democratic Party itself. Pundits on both sides of the aisle noted that this year’s Democratic National Convention was full of the patriotic pageantry typically associated with Republicans, and that speakers appropriated the rhetoric of family values and used it to sell progressivism. This is something Michelle Obama has been doing for years because she kind of had to, given the way she was caricatured during the 2008 campaign and the early Obama years as a sleeveless Black Power militant. She cloaked herself in the traditional gender role of the first lady and is now considered the most effective voice advocating for Clinton as president because of it. But in New Hampshire, Michelle Obama asked us to protect women just like her. And we listened and responded because, if nothing else, for the past eight years, she has shown us she’s just like us, or rather, the best version of us that we’d like to think we could be.